Canada's Trudeau Spurs Criticism, Raises Eyebrows on India Trip - Integration Through Media ....! 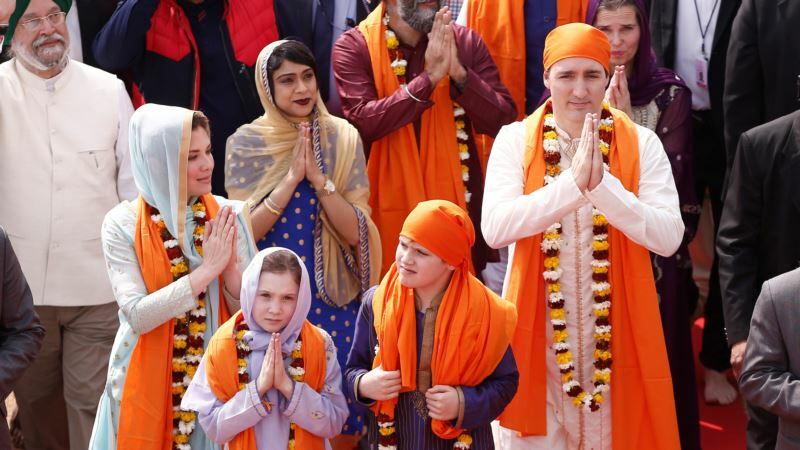 (VOA): Canadian and Indian officials scrambled on Thursday to explain how a convicted Sikh extremist was invited to a New Delhi reception for Justin Trudeau, the latest misstep in the Canadian prime minister's bumpy eight-day trip to India. The latest flashpoint, a swiftly cancelled invitation by the Canadian delegation to Jaspal Atwal — convicted in 1986 of the attempted murder of an Indian politician visiting Canada — came just days after Trudeau had assured his hosts he would not support anyone trying to revive a separatist movement in India. “The fact that an invitation, which was already extended to Mr. Atwal, has been withdrawn, it basically shows [Canada] have taken into account the concerns which we have,” said Raveesh Kumar, a spokesman for India's Ministry of External Affairs. Atwal's invitation was withdrawn once his links to an organization banned in India came to light. Trudeau told reporters on Thursday that a Canadian parliamentarian on the trip had taken responsibility for the mistake. A largely unrecognized figure in India, Atwal was a trending topic on Twitter across the subcontinent on Thursday after images of him in the company of Trudeau's wife and other Canadian ministers surfaced online. The trip, partly aimed at shoring up support for Trudeau's Liberals among the politically important ethnic vote in key regions, has also been criticized for being light on official government business. Support from Canada's large and concentrated South Asian community helped Trudeau's Liberals gain power in 2015, and all three of Canada's main parties — including the New Democratic Party, lead by Jagmeet Singh — are courting the Indo-Canadian vote ahead of the 2019 election. “I don't know if Justin Trudeau thinks that international trade missions are reality TV shows, but they are not,” Conservative party leader Andrew Scheer, Trudeau's main opponent, told Reuters. Trudeau on Tuesday cited C$1 billion in deals between Canadian and Indian companies announced in Mumbai, and said the trip was “not just about political ties” but improving business and cultural ties. The Atwal controversy came as the Trudeau family's ornate traditional Indian attire raised eyebrows, with the prime minister at one point donning formal wear typically worn by bridegrooms. “FYI we Indians don't dress like this every day sir, not even in Bollywood,” tweeted Indian politician Omar Abdullah. Additional reporting by Euan Rocha in Mumbai and David Ljunggren in Ottawa.